Microsoft Security Bulletins For July 2014 overview | ComTek Computer Services Inc. Welcome to the overview of Microsoft's Patch Tuesday for July 2014. It lists all information about this month's security and non-security updates for Microsoft operating systems and other company products. A total of six bulletins are released this month that fix 29 vulnerabilities in Microsoft Windows, Internet Explorer and Microsoft Server Software. Two of the bulletins have received the highest severity rating of critical, three a severity rating of important, and one of moderate. This means that at least one Microsoft product is affected by the severity in this way, while other products may be affected in the same way, less, or not at all. Check out the executive summary below if you are in a hurry, or read all sections of the guide for the complete picture. Six bulletins addressing a total of 29 vulnerabilities have been released by Microsoft this month. Affected products include Windows, Server software and the Internet Explorer browser. Two bulletins have received the highest severity rating of critical. 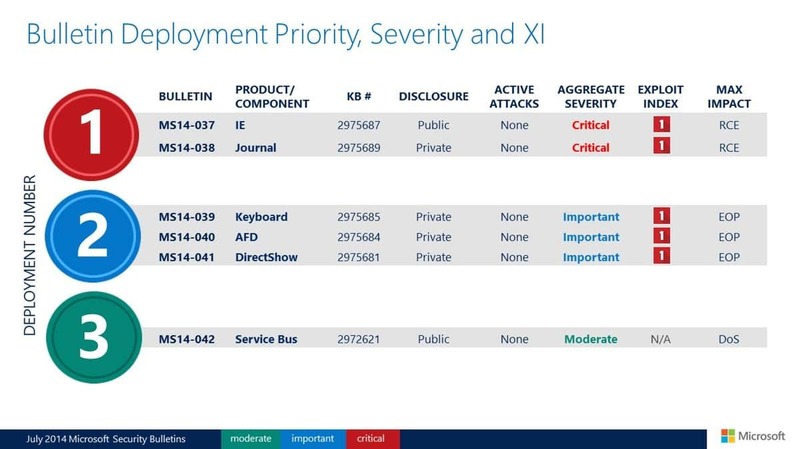 The top deployment priorities are MS14-037 addressing vulnerabilities in Internet Explorer and MS14-038 addressing vulnerabilities in Windows Journal. All Windows client-based operating systems with the exception of Windows RT and RT 8.1 share the same vulnerability distribution. All are affected by two critical and three important bulletins. Windows RT and RT 8.1 are affected by two critical and two important bulletins. The server distribution is identical as well except for Windows Server 2003 which is affected less severely. All server-based Windows products except 2003 are affected by one critical, three important and one moderate bulletin. Server 2003 is only affected by one important and one moderate vulnerability. Microsoft Security Advisory 2871997 (revised) - Update to Improve Credentials Protection and Management - Changes default behavior for Restricted Admin mode on Windows 8.1 and Windows Server 2012 R2. Microsoft Security Advisory 2960358 (revised) - Update for Disabling RC4 in .NET TLS. Update for Windows 8 and Windows Server 2012 (KB2937636) - Update to Microsoft Update client. Update for Windows 7 (KB2952664) - Compatibility update for upgrading Windows 7. Update for Windows 8.1, Windows RT 8.1, and Windows Server 2012 R2 (KB2959626) - Reliability improvements for Remote Desktop Session Host and RemoteApp. Update for Windows 8, Windows RT, and Windows Server 2012 (KB2960837) - Excel freezes when you convert Japanese characters in Windows. Update for Windows 8.1 (KB2962183) - Xbox Games app. Update for Windows 8.1 (KB2962184) - Xbox Music app. Update for Windows 8.1 (KB2962185) - Xbox Video app. Update for Windows 8.1 (KB2962186) - Bing Finance app. Update for Windows 8.1 (KB2962187) - Bing Health & Fitness app. Update for Windows 8.1 (KB2962188) - Bing News app. Update for Windows 8.1 (KB2962189) - Bing Sports app. Update for Windows 8.1 (KB2962190) - Bing Travel app. Update for Windows 8.1 (KB2962191) - Bing Weather app. Update for Windows 8.1 (KB2962192) - Bing Mapps app. Update for Windows 8.1 (KB2962195) - Windows Reading List app. Update for Windows 8.1 (KB2962196) - Calculator app. Update for Windows 8.1 (KB2962197) - Alarms app. Update for Windows 8.1 (KB2962198) - Sound Recorder app. Update for Windows 8.1 (KB2962199) - Bing Food & Drink app. Update for Windows 8.1 (KB2962200) - Scan app. Update for Windows 8.1 (KB2962201) - Skype app. Update for Windows 8, Windows RT, and Windows Server 2012 (KB2962407) - Windows RT, Windows 8, and Windows Server 2012 update rollup: June 2014. Update for Windows RT (KB2973544) - An update to enable an automatic update from Windows RT to Windows RT 8.1. Update for Windows 8 (KB2962156) - Camera app. Update for Windows 8 (KB2962163) - Xbox Video app. Update for Windows 8 (KB2962168) - Photos app. Update for Windows 8 (KB2962169) - Xbox Games app. Update for Windows 8 (KB2962171) - Xbox Music app. Update for Windows 8 (KB2962173) - Bing Finance app. Update for Windows 8 (KB2962175) - Bing News app. Update for Windows 8 (KB2962176) - Bing Sports app. Update for Windows 8 (KB2962177) - Bing Travel app. Update for Windows 8 (KB2962178) - Bing Weather app. Update for Windows 8 (KB2962179) - Bing Search app. Update for Windows 8 (KB2962181) - Reader app for Windows 8. Update for Windows 8.1 (KB2962193) . Microsoft Reader. Update for Windows 8.1 (KB2962194) - Help and Tips app. Downloads are offered via Windows Update and Microsoft's Download Center. If Windows update has not been modified, updates are downloaded and installed automatically on target systems. It may still be worthwhile to check for updates manually since it may take a while before Windows runs an automatic check for updates. The easiest way to do so is to tap on the Windows-key, type Windows Update, and select the results from the list. Here you need to click on check for updates to run the check manually. You can download all updates individually or in form of a monthly security ISO image from Microsoft's Download Center as well.